I got my posting! And so the real adventure begins… the rest of this has just been academic. 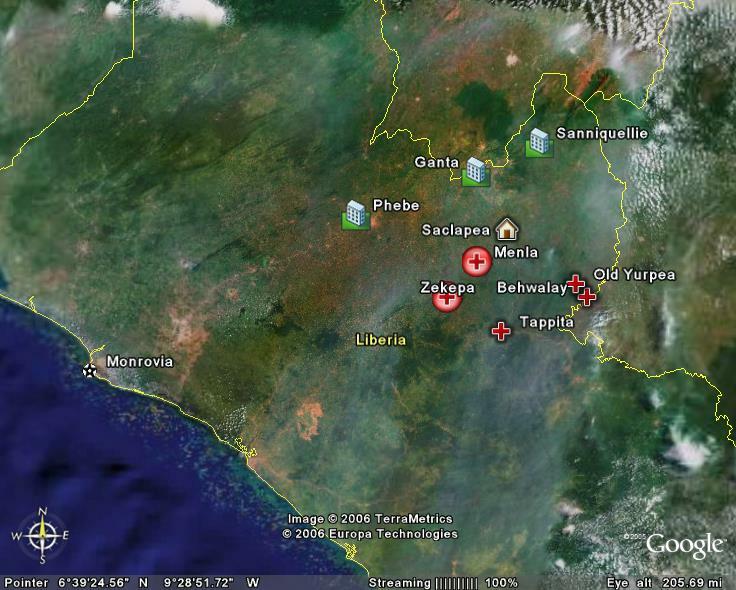 I’ll be working as a “log-admin” in an MSF-Switzerland project based on Saclepea, Nimba County, Liberia. The log part of my job is making sure things go smoothly so the programs keep running. The admin part of my job will be to handle paying salaries and keeping the books. My contract is for six months. I leave San Francisco for New York on a red-eye June 18th. I arrive in Geneva June 20th and spend several days there getting trained and talking to the previous log-admin from Saclepea to get a handoff from him or her. Then I fly south to Liberia, perhaps via Ghana or someplace. I spend a day or so in Monrovia, then make the trip out to Nimba. It’s the rainy season, and the road is not great, so it’s unclear how long that will take, or if it will even be possible to travel by road. I might have to fly to Saclepea. Here’s a map showing the area where the project takes place. Click the map for a larger copy. If you have Google Earth installed, you can click here to download the KML file. Other maps in PDF format, usable by all computers, are here. The latest UNMIL Situation Report gives interesting information about the reality on the ground (if you need an acronym explained, ask and I’ll do my best). You can find other information about the humanitarian situation in Liberia at the UN’s Humanitarian Information Center for Liberia.